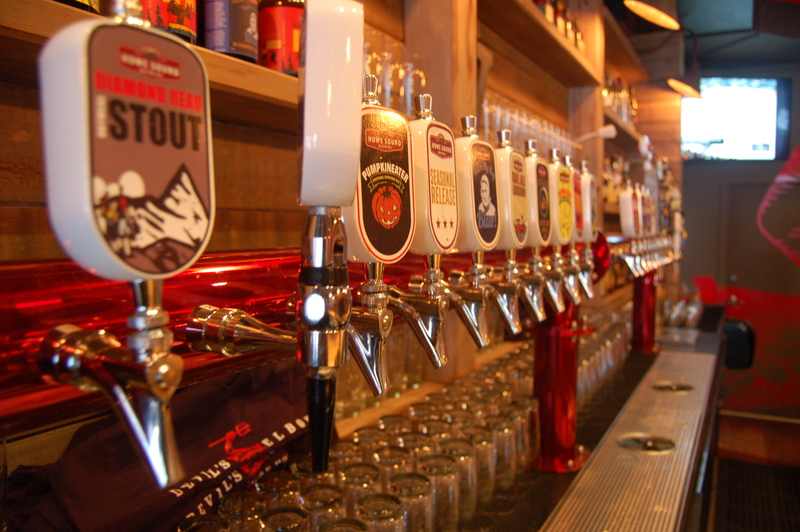 When I first heard that Squamish, BC based Howe Sound Brewing was going to be opening a tasting room in Vancouver in the old Chambar space on Beatty St after they moved a couple doors down, I knew we were in for something good! 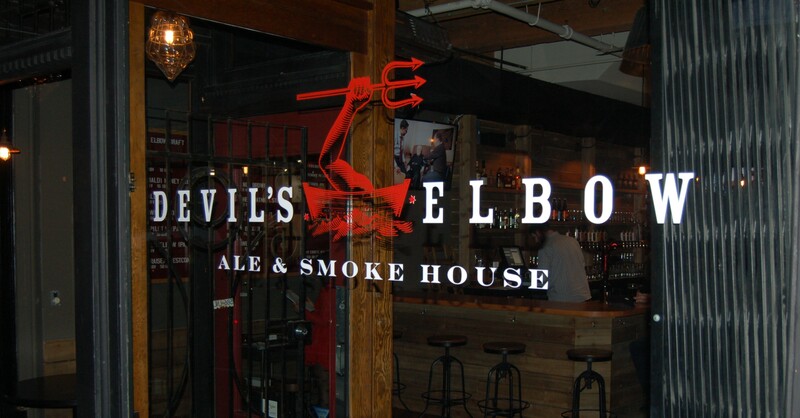 What I didn’t know, was that along with 15 taps of Howe Sound’s great beers, Devil’s Elbow Ale & Smoke House would also be offering a killer menu of smokey awesomeness. Once the doors were open I quickly got down there to see things first hand, and get some beers and sandwiches into my mouth. The menu at Devil’s Elbow is all about smoke, smoke and more smoke. “Snacks” include things like Smoked Chicken Wings, Chili with Smoky Beef Brisket, Yukon Fries with Smoked Creole Mayo and even a Smoked Pepper Soup. We then get to the “Sandwiches” like their Smoked Chicken Sandwich, Montreal Smoked Meat, Smoked Duck BLT and Brisket Sandwich. Lastly and also largely are the “Meat Plates”, including Beef Ribs, Pork Back Ribs, Beef Brisket and Pulled Pork, and rounded out by a killer Sausage Plate. These are all served traditional BBQ style with coleslaw and baked beans. The decision was made to try out the Smoked Duck BLT, because well, DUCK, and the Brisket Sandwich along with a couple Howe Sound beers. 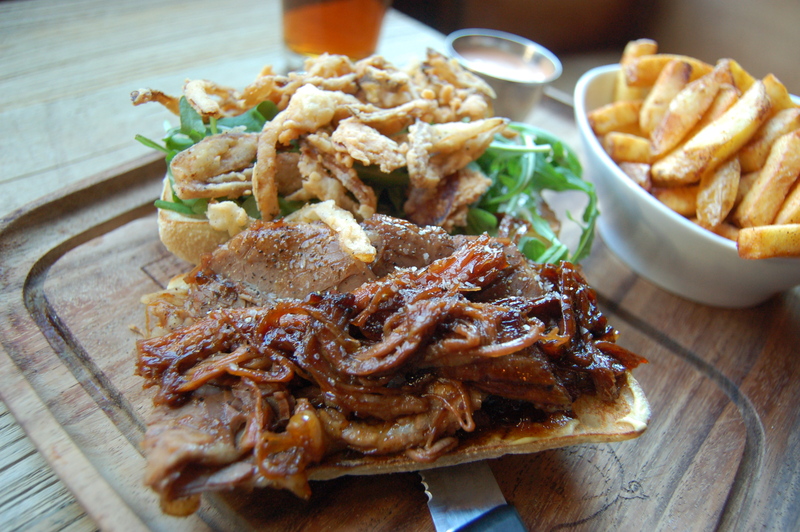 The first one to be brought out by Chef David McLeod was the Brisket Sandwich, which is beautifully presented on a wooden board with yukon fries and a smoked Creole mayo on the side, that must be tried. Right away the aroma of the 4 hour smoked and 3 hour braised beef brisket hit me. The brisket is piled high and slathered in a Honey BBQ sauce with crispy fried onions and arugula along with with dijon and creamy horseradish mayo on a familiar and fresh bun. This beef brisket is unreal, super sweet and ridiculously tender. Great crunchy texture comes from the fried onions that are lightly dusted with what I detected as an herbed flour and deep fried. The dijon and horseradish mayo offer a nice kick to balance the sweetness from the brisket which along with the fresh arugula creates a great roundness of flavours. The beer that seemed right for the Brisket Sandwich was a flagship brew from Howe Sound Brewing and the restaurants namesake. 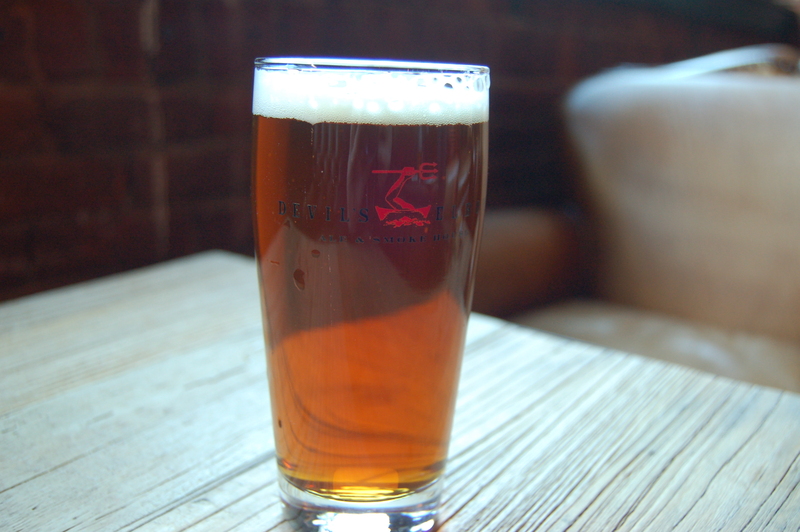 The Devil’s Elbow IPA is an assertively hopped IPA that is a super palate cleanser between bites of the sandwich. This well balanced “old school” IPA offers a good amount of hop bitterness that cuts through both the sweetness and the fat content in the brisket, while still carrying a subtle hop flavour through to the finish. I loved this sandwich and highly recommend having it with this solid India Pale Ale. Next up, it was time for some Duck, and the Smoked Duck BLT is a game changer. 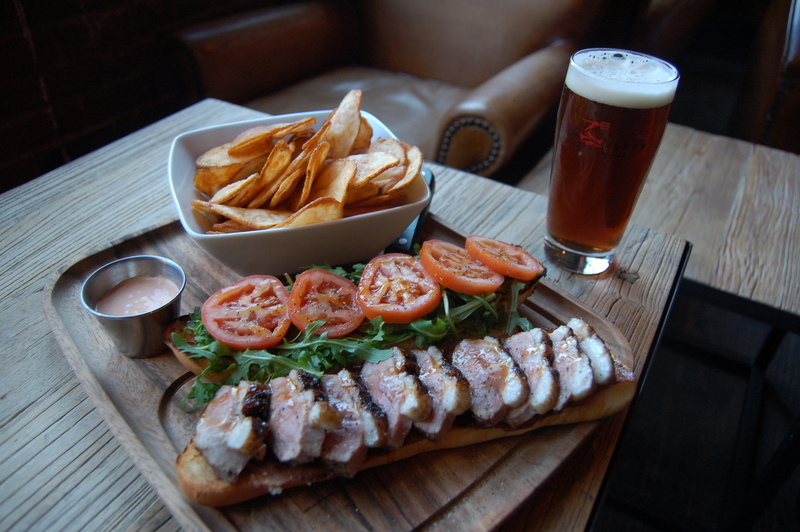 This sandwich comes with a perfectly cooked and delightfully smoked orange glazed duck breast sliced atop smoked bacon, ripe roma tomatoes and arugula topped with a rosemary onion jam on a brioche bun with a side of house made kettle chips. As the sandwich was placed in front of me all I could think was “Holy Duck!”. 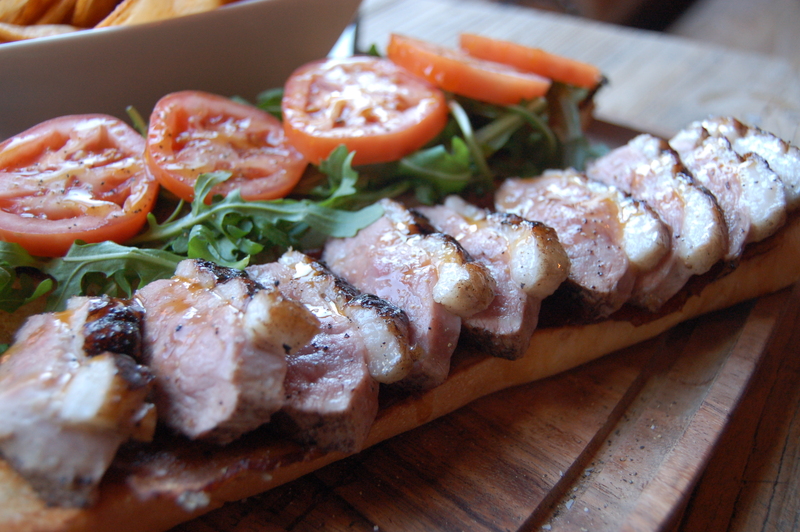 The duck breast alone would be worth the price of this sandwich and it only gets better from there. I found that the rich, fatty and smokey duck is complimented wonderfully by the smoky, salty and crispy bacon without seeming like too much smoke. A nice balance to that though, comes from the rosemary onion jam. That woody rosemary comes through huge along with a splendid sweet onion flavour as well. The arugula and roma tomatoes round out the “L” and the “T” on this above average “BLT” bringing a nice bright freshness to the sandwich. All these spectacular elements are nestled on the perfect and slightly sweet soft brioche bun. 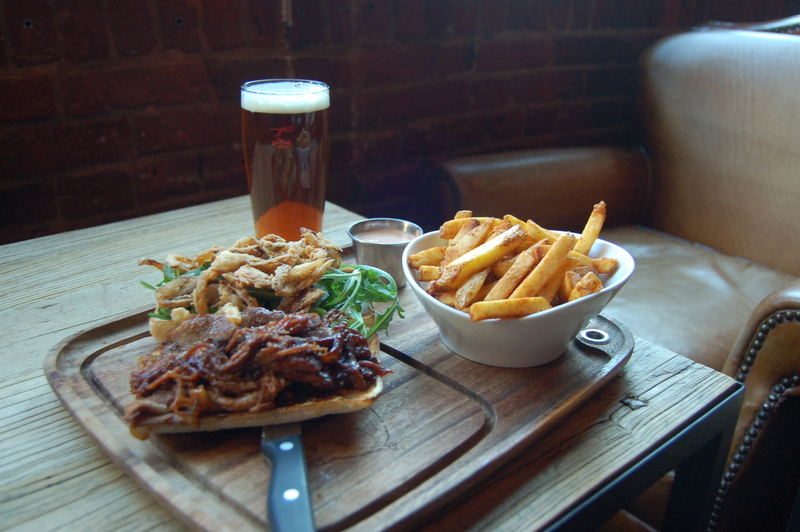 The beer for this sandwich I felt needed to be a bit more simple to really be a compliment to the richness from the duck. 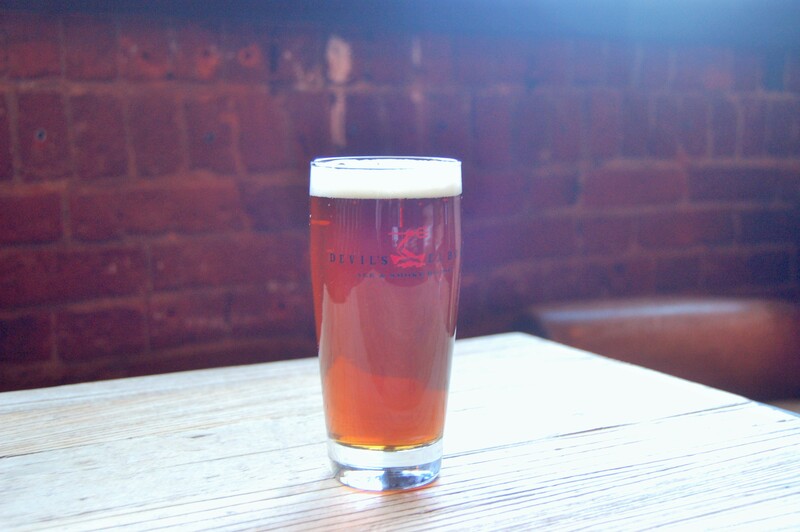 That beer came in the form of Howe Sound’s Troller Bay Ale, a smooth English-style amber ale brewed in tribute to one of the first craft beers brewed in Canada by craft brewing trailblazer John Mitchell. I found this malt forward ale to land very nicely with the smoked duck while still having enough hop aroma and flavour to not be lost against this bold and outstanding sandwich. So if you’re looking for a couple sandwiches that are two of the best I’ve had recently paired with two great beers from one of BC’s most established breweries at a place that has their whole line-up, then head to Devil’s Elbow Ale & Smoke House for This Sandwich and That Beer. 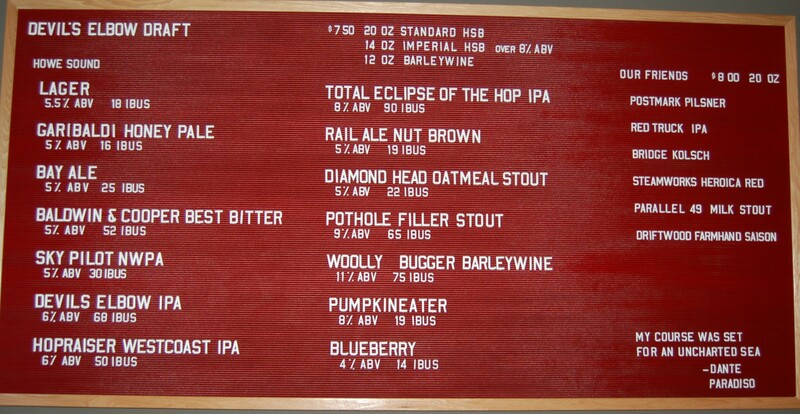 Head to www.devilselbowalehouse.com and www.howesound.com for more info, follow them both on Twitter @DevilsElbow_ and @howesoundbeer and follow me @tstb_blog. Head to Legacy Liquor Store to pick up these and other great beers from Howe Sound Brewing. Also, listen for my monthly feature Saturday Nov 29th on Just Here For The Beer radio on Team 1410AM in Vancouver at 12pm. 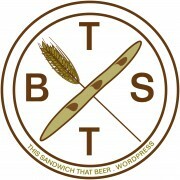 This entry was posted in Craft Beer, Uncategorized and tagged beef brisket, Brisket Sandwich, Howe Sound by thissandwichthatbeer. Bookmark the permalink. I am also a huge fan of the Devils Elbow. Great food and great beer! I can’t wait to get back there again soon.